It's All About Kids utilizes the heavily researched CATCH Nutrition Curriculum and other nutrition resources to design a curriculum to teach students how to make healthy food choices. Students are also encouraged to exercise daily to maintain a healthy lifestyle. The list below offers information about curriculum and resources IAK’s dietitians utilize within Tulsa County schools. For questions regarding Nutrition Environment & Services contact one of our Dietitians. Students will participate in weekly in-class discussions and hands-on cooking designed to increase their knowledge on MyPlate including the components of a well-balanced diet and where important nutrients can be found in food sources. Students prep, prepare, and consume several different food items and snacks. In addition, students will also learn about food science including acid/base reactions in food, fat conjugation, and the purpose of ingredients in some of our most common dishes. Finally, students will be able to utilize their most basic education skills such as reading/comprehension, math, writing, and critical thinking. Students will be required to complete a pre and post-test to assess knowledge gained. Students will be provided with basic nutrition education including healthy eating habits using the USDA MyPlate model. Students will participate in a 30 minute class discussion which will address the five food groups, foods included in each food group, how many servings of each food group we should have in a day, and basic health benefits of each food group (calcium for strong bones). Additionally, nutrition in the classroom will also incorporate several fun and interactive games designed to increase each student's knowledge of nutrition. All discussions and activities are tailored to each grade level. 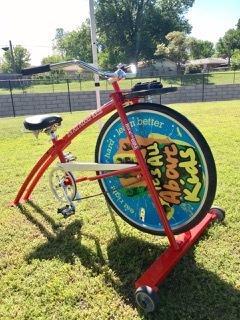 Blender Bike is a fun and interactive way to teach students about nutrition and healthy eating. Students will participate in an all-day event that includes interactive discussions coupled with games designed to increase their knowledge on the five food groups and their sources, as well as the importance of a healthy well-balanced diet. All discussions and activities are tailored to each grade level. Students will also have the ability to make smoothies using our signature "Blender Bike". Students in grades 3rd-5th will be required to complete a post-test following the day's events and a 60-day post-test to assess retention of knowledge gain during the event. Students will be provided with basic nutrition education including the five food groups, food sources in each group, and the importance of a well-balanced diet. Students will participate in a series of games including bowling, tag, and card games designed to educate and test knowledge of various nutrition topics. Additionally, each game is designed to meet the Oklahoma Physical Education and Health Education Standards. FoodMASTER FoodMASTER (Food, Mathematics, and Science Teaching Enhancement Resource) is teaching curriculum designed to improve the math and science skills of students in 3rd-5th grades with the use of food and food science. This curriculum is designed to incorporate one of the most basic human necessities (food) into a learning experience that allows for an interdisciplinary approach to science including biology, chemistry, nutrition, and health with mathematics such as algebra and problem solving. In addition to class discussions, the curriculum is equipped with food labs designed to provide a hands-on learning experience for each student. Nutrition consultations with a Registered Dietitian are available to teachers, support staff, and students with parent/guardian support. A nutrition consultation includes the delivery of a comprehensive, high quality nutrition support and education with focus on each individual's personal nutrition goals. A Registered Dietitian will discuss nutrition goals and personal objectives, as well as review medical history, including any medications and supplements. In order to help meet nutrition goals, we will discuss your dietary preferences, cooking/eating habits, food availability, and physical activity level to identify barriers and provide suggestions for growth and help meet nutrition goals. IAK is proud to partner with the Tulsa Drillers to bring your school the Sugar Shockers Assembly! Your 3rd-5th grader students will enjoy this interactive one hour long assembly. The Tulsa Drillers' mascot Hornsby and the IAK team teach students the importance of physical activity as well as how to monitor sugar intake in beverages and food that they eat and drink. To schedule an assembly for your school contact Melissa Horn-Speck.